The South Downs Way is a 100-mile path for walkers and cyclists and extends from Winchester to Eastbourne. We have now traversed 7% of that path. While that may not sound like a lot, it really has taken us some time. That’s because we do the round-trip (return), not the one-way (single) path. We might cover more ground if we took advantage of public transport to deliver us to one spot and pick-up at another. The second phase of our South Downs Way walk also started at the Jack and Jill windmills. However, this time we headed east towards Ditchling Beacon. The beacon, a small post in the ground, formed part of a chain of bonfire signals used to warn of the approach of danger. Back in the Georgian/Regency days, this could mean the possibility of an invasion from the French, or even the coming of the Preventive Officer, depending on who used the site. After the strenuous walk of the previous week towards Devil’s Dyke, we decided to take it easy. 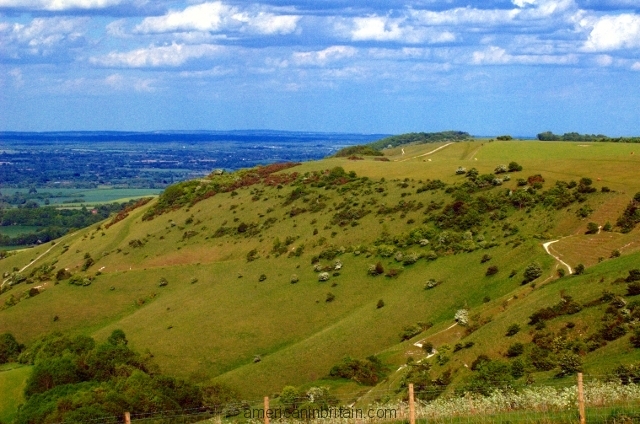 This part of the South Downs Way encompasses the Ditchling Beacon Nature Reserve. Parts of the reserve can be quite steep, but we only stayed at the top where the path is relatively flat. But it afforded wonderful views. From where we were, we could see out to the sea (English Channel). Cows and sheep were grazing contentedly all around us. The cows didn’t bother us, but we tried to avoid attracting their attention as we’ve heard the warnings about people being trampled to death. The sheep and little lambies were, well, “sheepish”. But our eldest managed to sneak up on a lamb and touch its fur before it ran away. It was not the best of days in terms of weather. It was quite windy and there was a slight chill, which did not help. The kids had not been very willing to go for a walk because of the Devil’s Dyke experience, but after chasing lambs, they were in a better mood. The younger one started to have a tantrum by the time we approached the beacon because she thought daddy and sissy were leaving her behind. When told to run ahead and catch up, she started throwing hysterics and crying, “I can’t. I can’t breathe.” As we took a few steps forward and an ice-cream truck came in to view, that was the end of her histrionics. It’s nearing the middle of May, yet we’re still experiencing some chilly days. So unlike this time last year. I can make that comparison because we were here on holiday this time last year. We’re expecting rain for the next couple of days, but the forecast has been amended several times in the last three days, so I really don’t know what to expect. The early spring flowers have wilted, the lambs have grown so big (though one still managed to squeeze in between the wire fencing the other day to nibble on our grass), the trees have all blossomed. Father Christmas brought our older daughter a flower-growing kit and she started that very early in spring. So far, we’ve had a lot of growth, but no flowers yet. One is going to be a giant sunflower, so I can expect that to take a very long time to produce a flower. The other three are small flowering plants, so I’m hoping to see something soon out of the marigolds. I’ve only tried planting marigolds from seeds once. Unfortunately, that was around the time we sold our house, so I never got to find out if it bloomed. I don’t have much of a green thumb, so I’ve left the managing of the plants to the kids and my husband. Though I’ve helped transfer the plantings to progressively larger containers. The plants have been kept outdoors for the last month and a half, and surprisingly, the birds did not bother with the seeds. Or, at least, we don’t think they have. We have a blossoming tree that flows into our yard but I have not yet identified it. Besides the buttercups and dandelions, we have no other blooming plants at this time. The daffodils are gone and the bluebells are about to. The roses have not come out and I wonder if they will. They look like they could use some pruning. I’ll have to try those shears. You can see why I’m anxious to have some flowers growing. It just would not be an English cottage without some flowers. Driving around the countryside, I am very envious of those beautiful cottage gardens. As the green campaign is very important in the EU, we’d like to do our part. Our grass, which stayed green throughout the whole winter practically, shot up in the last month. It is nearly a foot in some areas, with the weeds even higher. We don’t have a lawnmower and it seems a waste to get one. We would have no place to store it anyway. The edge of the lawn by the fences are nice and trim due to the sheep sticking their heads through and feeding to their content. We had considered letting the sheep graze on the lawn to keep it low. We see that they are doing a wonderful job along the edge. But we worry about the smell and mess of sheep manure. After all, the kids still like to run around in their barefeet. The landlord had even suggested this option when he saw the lawn, so he would have no problems with it. It’s been rather tricky catching the farmer, though. He visits once or twice a day, very briefly to do what he has to do. In the last couple days, one of the lambs has found his way outside of the gates and was grazing on common grass areas. I was tempted to lure him into our yard and let him feed, but the sheep and lambs are still somewhat wary of us (except for the flocks that chased us in the fields). Even the ones feeding on the edge would turn and rush away when we open the front door. As I said, we’d like to do our part to reduce carbon emissions and there’s no greener lawnmower than a sheep or goat. We just need to resolve the manure issue. Oh, and get the farmer’s permission as well. We wouldn’t want him to think we were stealing his animals.